Years ago, when I was the new kid on Flash Gordon, I did a Sunday page where instead of the planet Mongo I drew upstate Minnesota – terrain and clothing. A friend on staff at King Features, cartoonist Jerry Craft, pointed out the error of my ways – especially in the third panel where a guy with a dress shirt and sweater seems to have mistakenly wandered on to the Flash Gordon set. Suffice it to say I tried to stay a little truer to the spirit of the strip Alex Raymond created after that. Retelling Raymond’s first story so as to brush up on the strip’s basic elements. 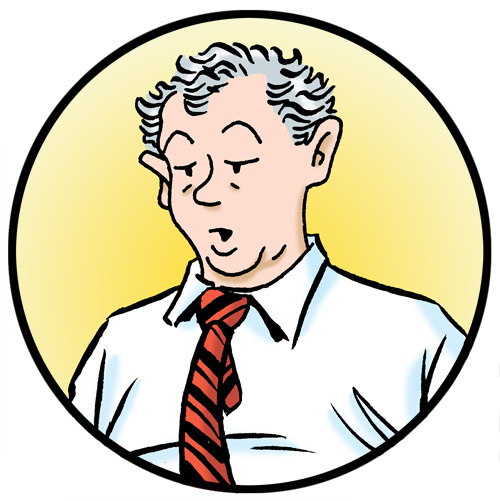 Jump forward a decade or more later and I now purposely use the thought of a character mistakenly wandering on set whenever I draw Sally Forth’s Mother’s boyfriend, Gerald. Here’s Francesco Marciuliano’s stage direction for Gerald from the September 22nd Sunday page. If the panel was a sound stage I picture the director yelling, “CUT!” every time Gerald stumbles into a scene. This entry was posted in Flash Gordon, Francesco Marciuliano, Sally Forth and tagged Francesco Marciuliano, Sally Forth. Bookmark the permalink.